I think that if more backpackers bought into this philosophy that they would experience far less problems with knees not to mention blisters and twisted ankles. I really enjoyed the book. We have a plant that grows here in Southern California called Chia. I’ve always heard that the native Americans ate the seeds. Maybe after they go to seed this year I will collect a small sample to see what they are like. Otherwise, I guess you can buy them but I hear they are expensive. I thought often whether I could hike the trail in sandals, but I kept jamming sticks into the tops of my feet and every time I did, I was glad I had shoes on. Also, after 25 miles, the ground really started to feel hard and I was glad to have something soft and squishy to cushion the blows. I would even carry extra padded insoles to stuff in for road walks. Nevertheless, I found a couple sources for tire sandals. I would like to make tire-soled moccasins. I think those would be good for hiking. Long ago I read Ray Jardine’s book and he went on about building up strength in your ankles and feet rather than relying on boots, so I tried it way back then and was hooked. When I hiked the trail, I had no worries about my ankles. They are like tree trunks. 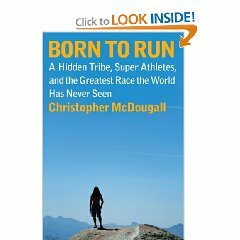 I was inspired by this book to try some barefoot running. In the past, any kind of running quickly caused me injuries, but barefoot running has only made me feel good (aside from pulling goatheads out). I was also inspired by much of the material at runningbarefoot.org. I don’t have anything sharp and pointy at my place( except rocks) so I should be able to run barefoot and as the ice recedes it’s getting muddy—that feels nice. I’m so excited to be giving up on the shoes, insoles, doctors, and gadgets to make my feet feel better. My motto for this year is: whatever the problem, money is not the solution. I spent several years hiking in sandals and tried barefoot hiking as well, mainly because I was having problems getting shoes that didn’t cause blisters. I’ve since switched to heavy boots. I now spent about $100/2000 miles on boots, never get blisters, can walk through anything without worries about getting hurt. My experience with barefoot is that you need to be extremely careful at first, since you will be accustomed to the protection of shoes. In particular, people who’ve worn shoes all their life tend to swing the foot without worrying about slamming into rocks, relying on the shoe to protect the sole and toes. Eventually, your brain will adjust to barefoot, but be very careful the first few steps. I mean that literally. Once I took my sandals off and without two steps had slammed my foot into a rock and broken the nail off. You also have to get used to walking around with splinters and thorns in your feet–they eventually work their way out and you forget about the minor pain they cause. The worst injury I ever had barefoot occurred when I slipped going downhill on a steep trail with little pebbles of granite on top of some hardpan. I allowed my right foot to turn upside down in an effort protect my knees (hard to explain, but it’s an instinctive reaction and works if you are wearing shoes), forgetting I was barefoot. Result was to rip the entire side of my big toe off. Blood everywhere. And yes, I stubbed my foot into sticks now and then. Bushwhacking through blackberries and other thorns is a particularly problem with barefoot and sandals alike. But then again, the PCT and AT are both far better groomed then the European trails I spend much of my time on. Finally, most people who use sandals eventually get heel cracks. Supposedly, true barefoot hiking avoids this problem, since the friction is not concentrated at the edge of the heel but rather distributed evenly. Another theory is that you need to let your feet get cold at night to get the oils flowing. Primitive desert people typically sleep with their feet outside their blanket or cloak or whatever it is they sleep in, at least down to freezing or thereabouts. Don’t believe the nonsense about how primitive people prefer sandals to boots. They love boots. Problem is, they can’t afford decent ones and they ones they can afford are made for weakling feet–long and narrow with collapsed arches–rather than strong feet–short and wide with normal arches and huge around due to well-developed muscles. My experience is that the only boots that are made for strong feet are work boots and military boots. Modern military boots (Belleville 600’s) are especially good and this is what I walk in now. I still recommend everyone try barefoot walking. Work up to being comfortable on railroad gravel, mainly to learn how to walk properly and reawaken your nerves. Then put on some heavy Belleville boots and continue to walk as if you were barefoot–this is the best combination. Thanks for the tips, Frank. I have been walking barefoot, in socking feet, in a pair of mesh aqua shoes, or in my MBT shoes now for a couple months. Yesterday I did about 5 miles of my 7 mile walk completely barefoot and the other two with the mess aqua shoes. The cold has been hard on me. Some days I do great on the rocks, other days I can’t seem to get into the grove. I’ve never worn military boots but I spent 20 years in work boots and hated them. I know I really hate road runners and miss boots when I hit the steep snow as road runners are like hiking in ballet slippers in the snow. I’m sort of peeved right now on all the money I spent on my feet and how they still hurt and this year my theme is to not throw money at problems. So, I’m trying to work out this barefoot thing. Sometimes it’s great other times it takes all the fun out of walking. Hoping to hit a trail this year and try out barefoot/minimalist footwear. It would be so great to hike without sore feet. I’m thinking it isn’t your feet that get weak when you wear shoes so much as your legs get weak and your feet are overworked.